More than 48 contributors participated in this Gutenberg release. It marks the addition of the very expected Group block (sometimes referred to as container or section block). It’s a minimal version at the moment and improvements about the flows to add inner blocks, group/ungroup blocks are expected in follow-up releases. The bug fixes from this release will be backported to WordPress Core in order to ship in the upcoming WordPress 5.2 release. This release includes a lot of improvements to existing blocks and flows. Automatically add `mailto:` to email addresses when linking. The following benchmark compares performance for a particularly sizeable post (~ 36000 words, ~ 1000 blocks) over the last releases. Such a large post isn’t representative of the average editing experience, but is adequate for spotting variations in performance. 👏 Kudos to all the contributors. Thank you. Reminder: A widget sidebar is just a group/container block. There is no longer a need for a separate interface to manage widget placement!!! Definitely! In a world where themes are made of block templates instead of php templates, there’s no need for widget areas. We’ll eventually get there where everything is made of block templates and blocks but we need to make smaller steps first. and the first one is the ability to use blocks instead of widgets in existing themes. 1. Leave the existing widget interface as is and create a legacy widget which simply displays a group block*. This will get you backward compatibility. 2. Focus on the group block builder interface and depreciate the widget interface screen completely. 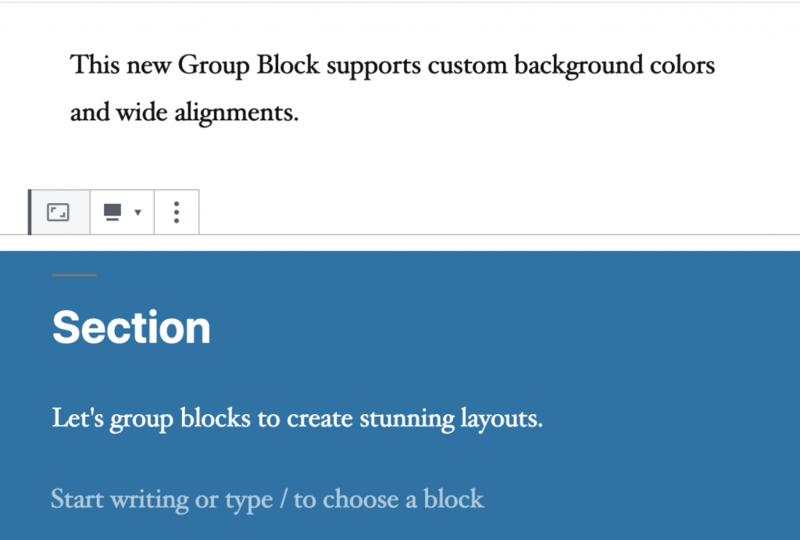 *for ease of use, you could create a default set of group blocks mirroring the sidebar names of the installed theme and auto insert the group block widget (with no content) into each of those sidebars. That will enable people to work 100% within the new group block builder interface.